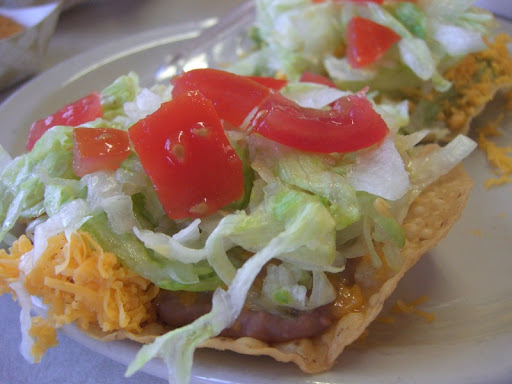 I usually do the research for our food travels, but this time Sherry was looking on chowhound and came up with this lunch stop on our way east from Tucson to Austin. 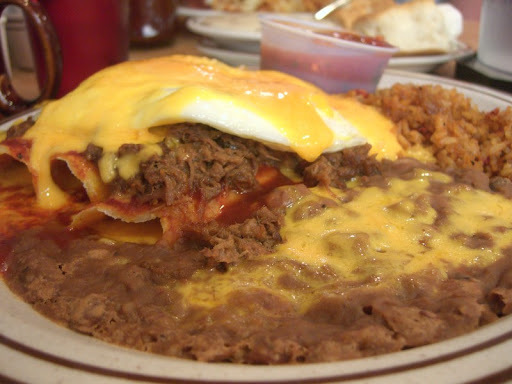 Located in a small community south of Interstate 10 just a few exits into Texas and just before El Paso, Little Diner was a perfect stop. 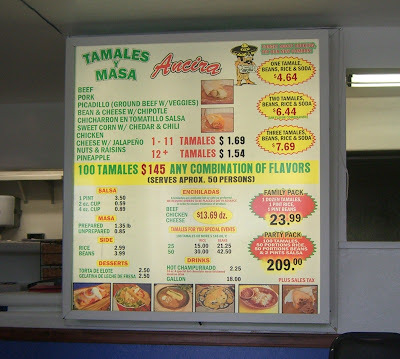 In addition to being a fan of the food traditions from the source, I am also an unapologetic fan of the various regional american incarnations of Mexican food. 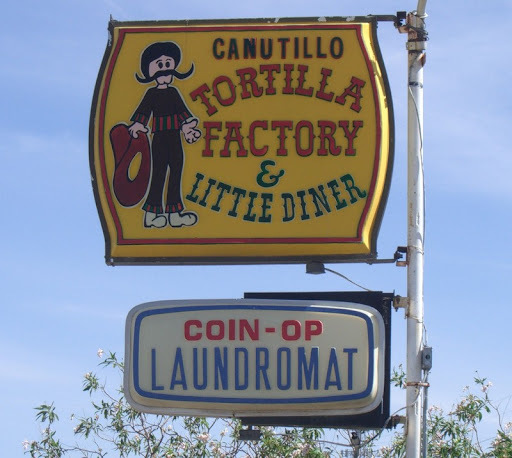 I love San Diego carne asada burritos and fish tacos, a fantastic green-chile-topped breakfast burrito in Denver, and I'm always up for trying a new local variety. Yellow cheese and all. But back to Little Diner. First up were their two gorditas, a menu item we don't see in San Diego very often. 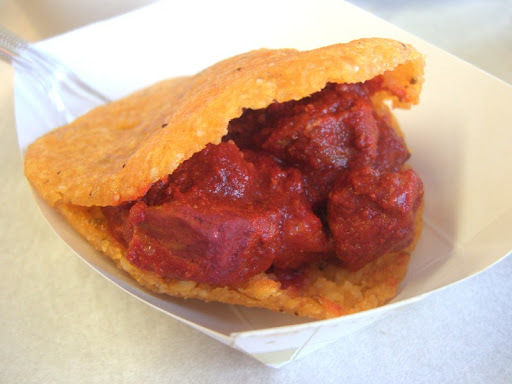 The chile colorado gordita was fantastic. The meat was perfectly cooked and had a great depth of flavor along with a nice heat. 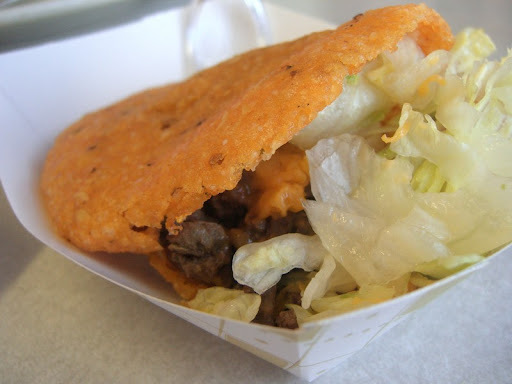 The other gordita on offer was the "meat" gordita, which ended up being a pretty standard, if tasty, ground beef. We still ate every bite, though, because the real star was the masa pocket itself. Crispy on the outside, but thick enough to have a different texture on the inside. Just great. 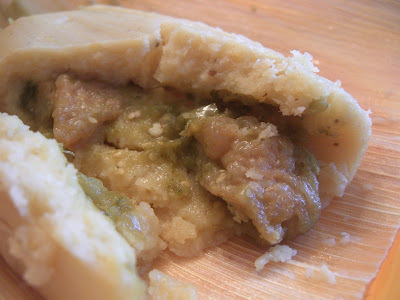 We also also tried their "tapatillas", which were basically tostadas. And they were basic, but really good. We got one bean and one avocado. The bean tapatilla was fantastic - great refried beans (which is a critical test, in my opinion, and one that is failed all too often) and the tortilla was perfectly crispy and had clearly been just fried. To drink, what could we have on our first meal in Texas but tea? 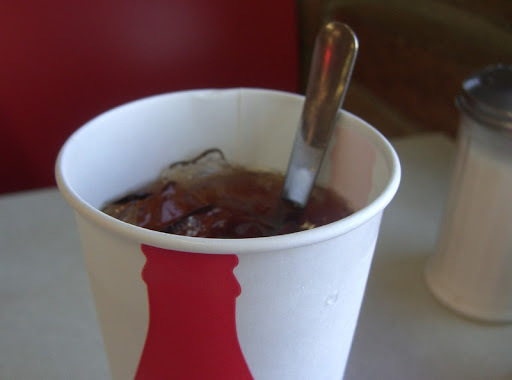 It was served unsweetened, but the spoon and prominently placed sugar container suggested modification. Being staunchly Californian in our approach to iced tea, and knowing that a whole lot of sweet tea awaits us as we travel on, we left ours unadulterated this time. 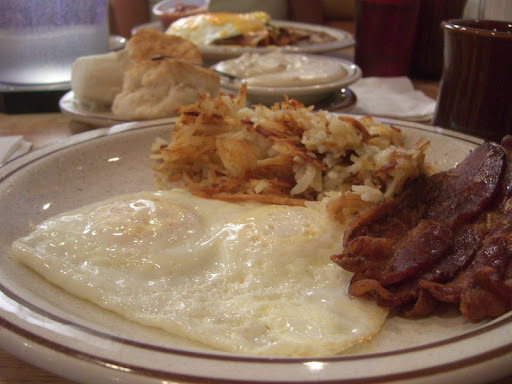 A road trip isn't official until you've had your first gut-busting breakfast at a truck stop. 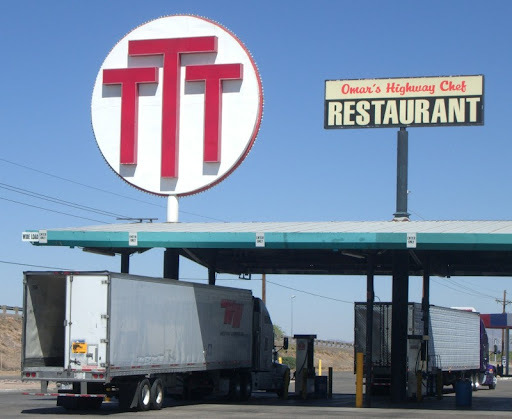 This trip, we got things started at Omar's Highway Chef at the Tucson Truck Terminal. Booths and diner-style counter seating? Check. Nice waitress (but don't mess with her!) 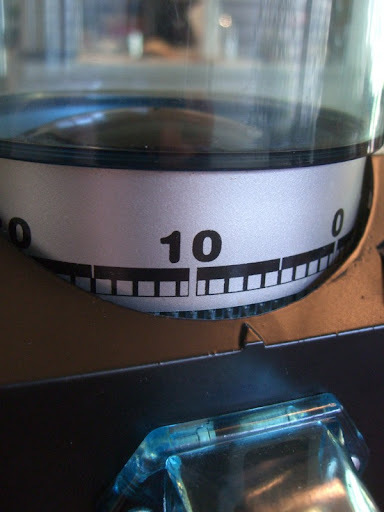 keeping your coffee constantly full? Check. I went conservative to ease myself into the road-trip lifestyle. My over-easy eggs were perfectly cooked. The bacon was good, but the six pieces or so was a bit much for me to handle. Fine hashbrowns (the buttery, crisped mash style, not the crispy shreds style). Biscuits were good, but the sausage gravy didn't have much flavor. She asked if she could get one with 2 eggs and 2 enchiladas, but was denied. I guess it would violate their minimum calories per person policy. Again, the eggs were perfectly cooked. Everything else was tasty, but unsurprisingly a bit rich and a lot too much. Well, more east than south, really. We're off to visit some cities we've never been to. 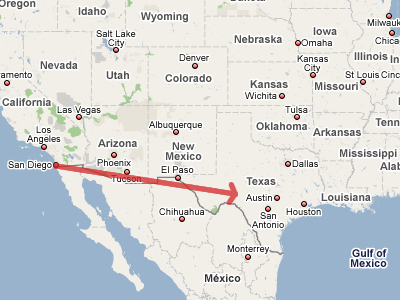 After we burn (literally) through the desert, Austin and New Orleans are our first destinations. After that, we'll see what happens. We don't have much of a fixed schedule, other than swinging around through West Virginia in late June to meet up with Elise and Tom at Tom's family place there. Mole Coloradito is our favorite mole. 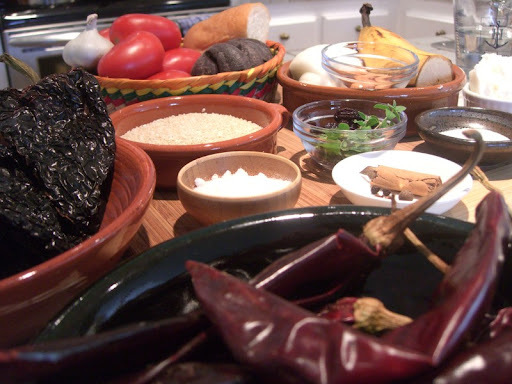 We've been making it with mole paste that we brought back from Oaxaca. Out of curiosity, and given that our paste is running out, we decided to make a batch from scratch using the recipe we used at Susana Trilling's Seasons of My Heart cooking school. 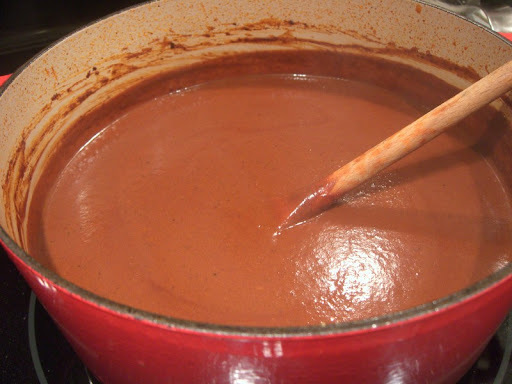 Making this mole takes a lot of ingredients and has a lot of steps - it makes it pretty clear why you can buy mole paste! Here is a collage of the steps (homemade stock not included). Click on the photos for an enlarged picture and a description. Our recipe required 20 ingredients: ancho chiles, guajillo chiles, mexican cinnamon, whole allspice, black peppercorns, whole cloves, garlic, white onion, tomatoes, fresh marjoram, ripe plantain, bolillo bread, almonds, raisins, lard, sesame seeds, mexican chocolate, sugar, sea salt and chicken stock (requiring an additional six ingredients). 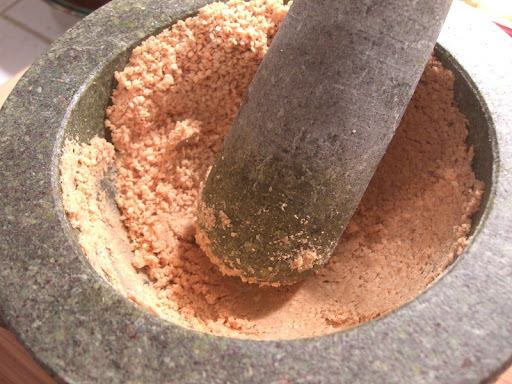 ... 5 - running the puree through a food mill if necessary and 6 - adding each puree to a simmering pot in stages to create multiple levels of flavor. 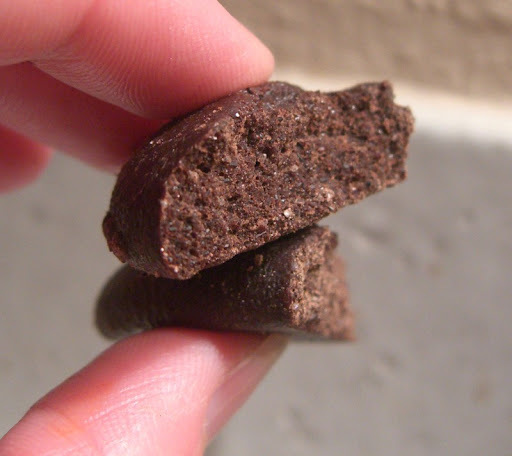 Mexican chocolate has a grainy texture - you can actually see the sugar crystals. One of the reasons we prefer Coloradito is that it uses less chocolate and is not as sweet as the darker moles. All in all, it took about six hours to get to the point where it could be refrigerated overnight to let the flavors meld (next time it won't take that long!). After that, several more cups of chicken stock were slowly added to the gently simmering sauce until a good balance of flavor was achieved. 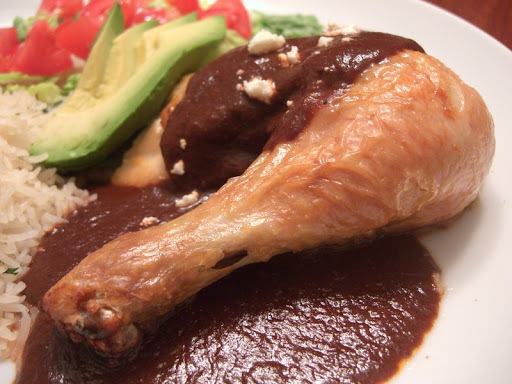 Traditionally, the mole would be served over pieces of poached chicken or turkey. While this makes perfect sense (the poaching gives you stock you can use for the mole) we aren't big fans of the texture of poached chicken. We prefer it served over roast chicken. So, is all this effort worth it? Absolutely! This is a fantastic dish that is easy to make and packs a huge flavor punch. 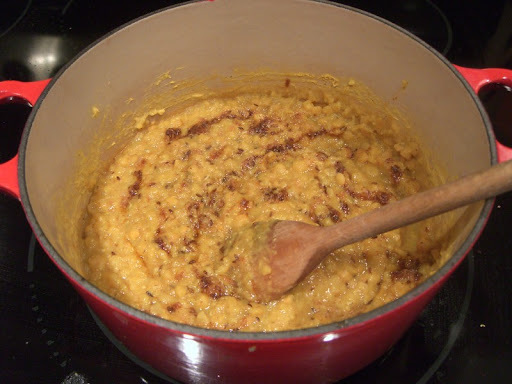 The combination of the red lentils and the yellow split peas result in an interesting, multi-layered texture. 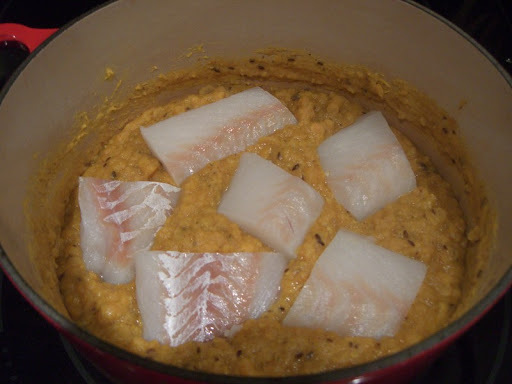 Both cook up quickly and turn into a rich tasting, but not heavy, base for the fish. 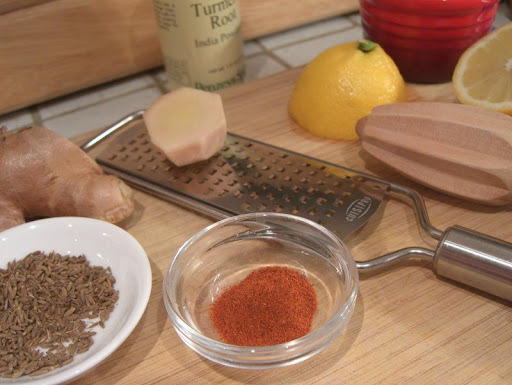 The flavor profile is Indian/North African, including ground turmeric, cumin seeds, fresh grated ginger, cayenne pepper, fresh lemon juice and fresh cilantro. The lentils and peas are simmered in chicken and fish stocks with just a little turmeric until very tender, then seasoned fully with salt. I often use canned broth and/or concentrated stock base, both of which have some salt already. When I use homemade, unsalted stock, the seasoning step requires a fairly heavy hand. The intense flavor of this dish comes from aggressively toasting the cumin seeds in hot oil, then browning the ginger and cayenne for a minute longer. Along with lemon juice, this spice mixture is stirred through the lentils and peas. 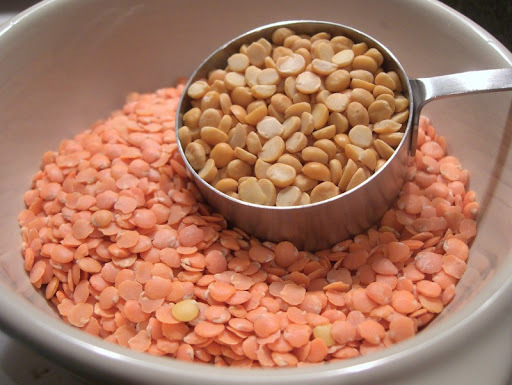 Almost any firm fleshed fish will work with these lentils. 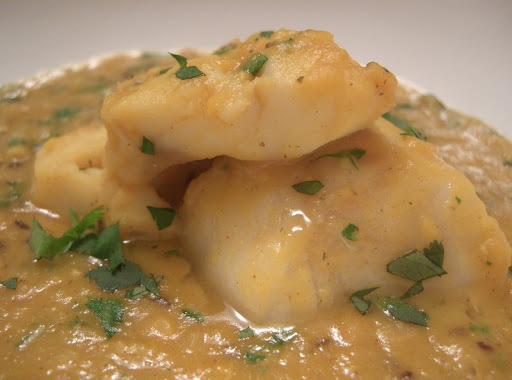 Pictured below is Alaskan Cod, but we've also used local Sea Bass and Yellowtail, as well as Mahi Mahi and Salmon. Once the fish is cooked, the last thing to do is gently stir in plenty of finely chopped cilantro. I love that this fragrant and spicy dish needs almost no prep work and takes well under an hour to make. When we have leftovers, we sometimes make them in to croquettes (check out our Feast of the Seven Fishes post from last Christmas Eve for pictures). Plenty of seasoning is important for this dish. The amount of salt required will be dependent upon the saltiness of your chicken and fish stock or broth. In a high sided, heavy-bottomed pan or dutch oven, combine the chicken stock, water, fish stock concentrate, turmeric and 3/4 teaspoon kosher salt. Bring to a boil, stir in the yellow peas, reduce heat, cover and simmer 5 minutes. 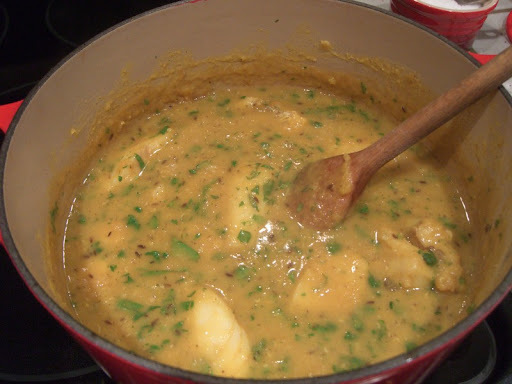 Add the red lentils to the peas, cover and simmer an additional 20-25 minutes or until the peas are just tender. 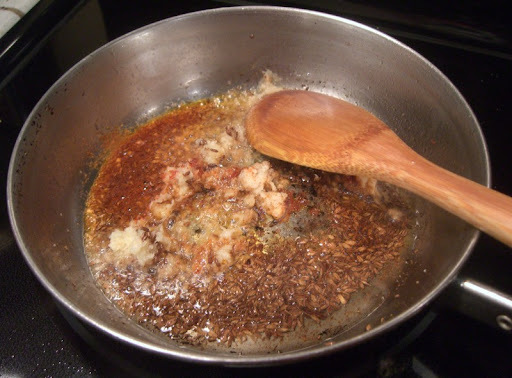 Meanwhile, heat the 2 tablespoons oil in a small frying pan. When hot, add the cumin seeds. 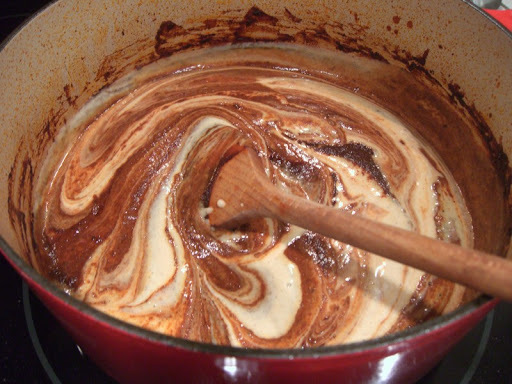 Stir briefly and when they begin to pop and turn dark brown and fragrant, stir in the ginger and cayenne. Cook another 60 seconds until the ginger is soft and begins to brown. Pour the hot spice mixture over the lentils, add the lemon juice and stir. Taste and add salt if needed. Cut the fish into 4 or 5 large chunks and season lightly with salt. Lay the fish pieces over the lentils, cover and cook very gently for 10-15 minutes or until the fish is opaque and flakes easily. Keep the heat fairly low in order to avoid scorching the lentils at the bottom of the pan. Gently stir in the 1/4 cup chopped cilantro. Serve in warm, shallow bowls and garnish with extra chopped cilantro and lemon wedges. 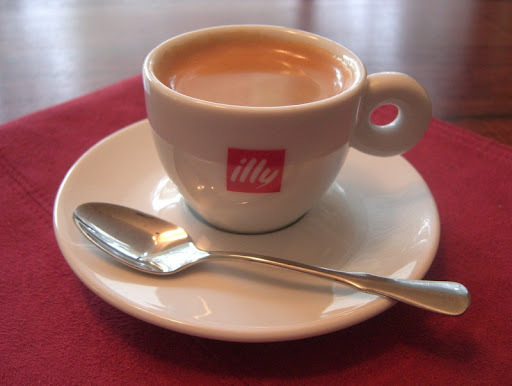 So, what to have for breakfast with a nice cup of espresso in the morning? Eggs and toast, of course. 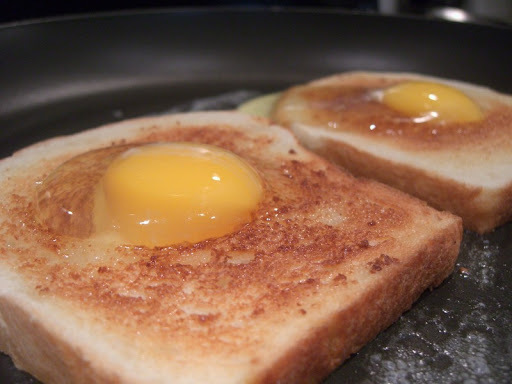 And the simplest, most perfect way I know to do eggs and toast is egg-in-toast. For me, it has the flavors and textures I associate with soft-boiled eggs, but is even easier to prepare. It is also known as egg in the basket or toad in the hole. I've always known it as egg-in-toast, so egg-in-toast it will be. First, of course, you need the toast. This time we're using Sherry's first batch of "American Sandwich Bread" from Baking Illustrated. 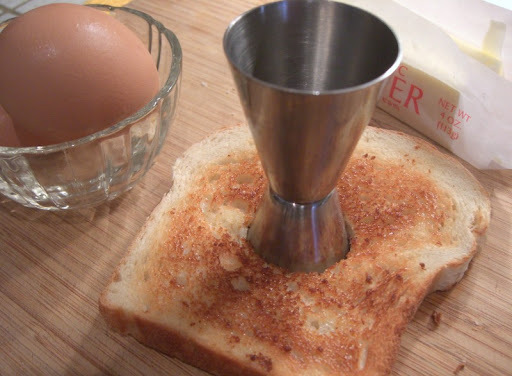 Then, to get the egg in, you need a hole. To make one, we use the small end of a jigger (hey, "drink" is in our blog title, after all). 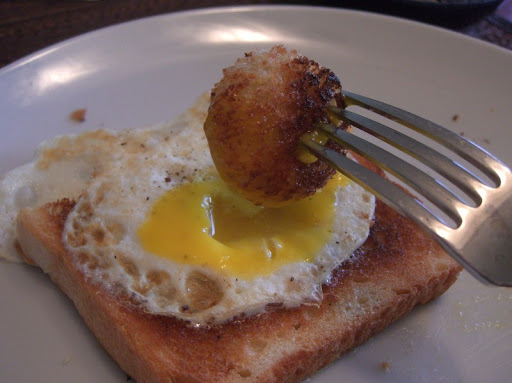 Put the punctured toast in a buttered frying pan and crack a yolk in (Sherry likes to use a small dish to crack the yolk into and then pour it into the hole). 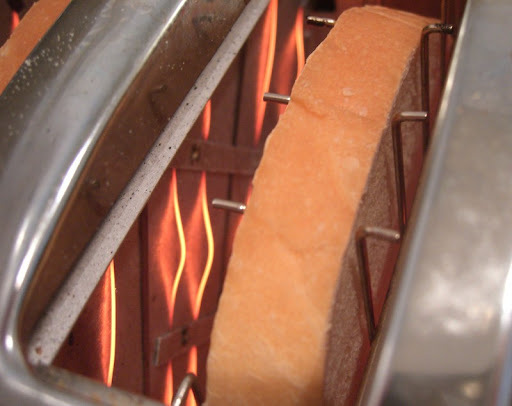 Don't forget to use the "toast-hole". 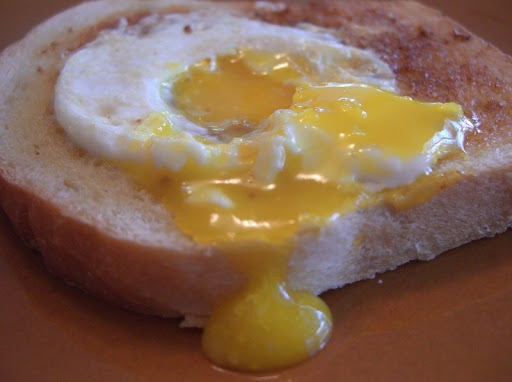 It makes a perfect vehicle for soaking up that first fantastic dollop of sticky yellow yolk. Forever ruined by traveling in Italy, we are addicted to a well-made espresso. Unfortunately, here in the land of "how many shots would you like in your über-grande-mocha-madness", a good espresso is very hard to come by. 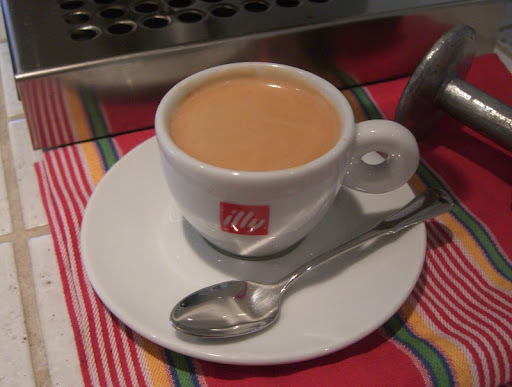 Buying a semi-commercial espresso machine, while an initial high upfront cost, has definitely paid dividends. 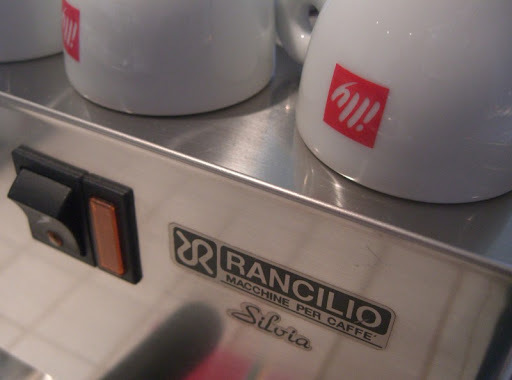 After more than seven years of constant use, our machine is still running just as smoothly as the day we got it. 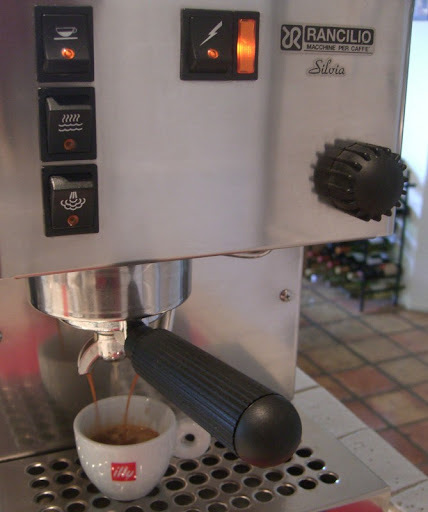 As important, if not more important than a good espresso machine is your grinder. 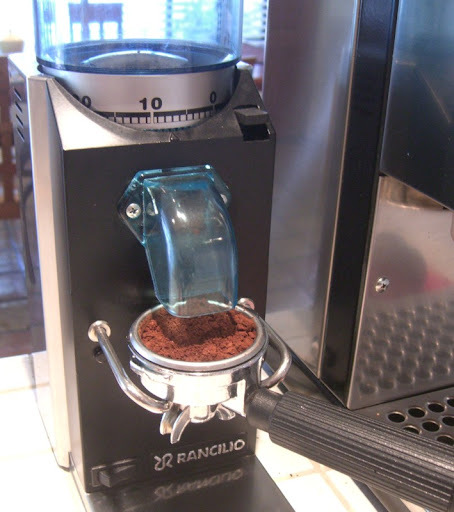 A burr grinder is an absolute must - and don't skimp on the price. 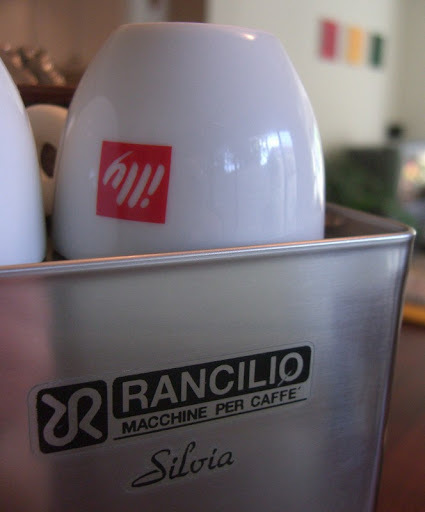 We started with a cheaper grinder, but soon upgraded to the Rancilio Rocky. The difference was significant. Rocky makes it possible to get the perfect grind. 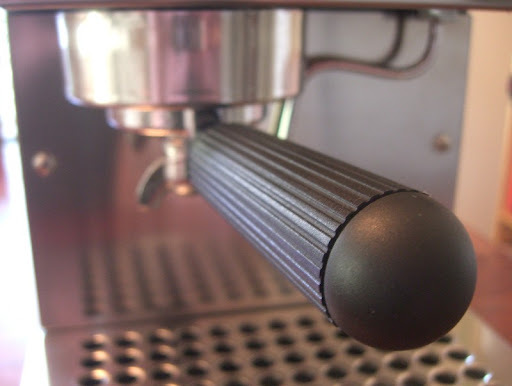 Figuring out exactly what that is takes a lot of experimentation, but once you have it locked in you'll be enjoying a perfect espresso time and time again. Making a good espresso is definitely a bit of a Zen art - getting the perfect grind, figuring out exactly how much coffee to use, tamping it down just right. That's probably why it is so hard to get a good one. 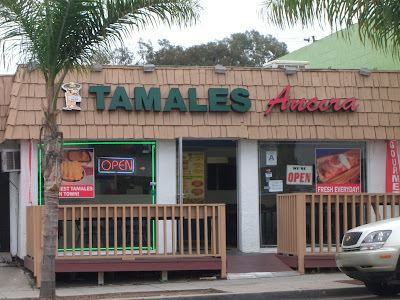 Tamales Ancira, a store that has been operating in Chula Vista since 1989, opened up a location on Garnet Avenue here in Pacific Beach about a year or so ago. 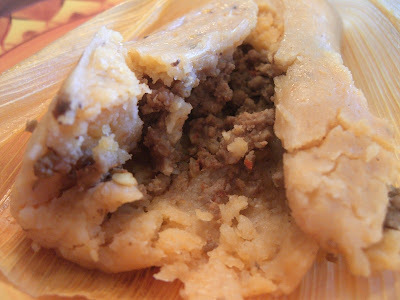 While they aren't going to make us forget about the tamales we had in Oaxaca, they do a very good job and we are really lucky to have such a great place just a few blocks away from our house. 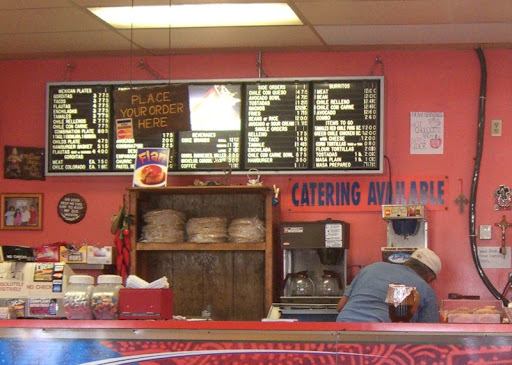 They are primarily a take-out business, but they do have a few small tables if you want to eat there. 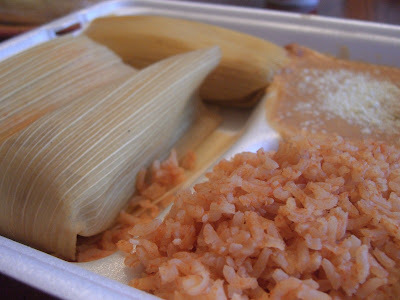 You can order your tamales a la carte, or as a combo plate with rice and beans. 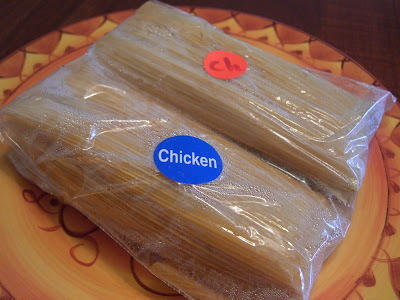 If you order tamales a la carte, they wrap them up nicely for you. 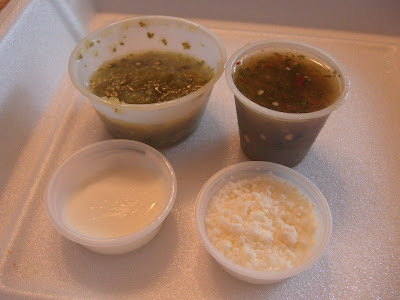 They also give you salsas, cheese and crema. Today they were out of their red salsa, but we got their green salsas. One is a traditional tomatillo-based salsa verde, and the other is a mixture of green and red chiles. Both are relatively mild, but very tasty. First up, the chicken tamal. They do it in a flavorful red sauce. I love the way the redness stains the masa. Chicharrón isn't my favorite thing in the world, but they do a good version - cooked until fully soft and not chewy like it sometimes can be. The picadillo is generally very good, but this time around the meat was a bit dry. Like all the others however, the masa was flavorful, soft and well seasoned. 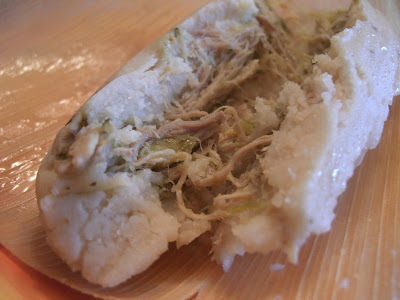 Here is the pork tamal - moist shreds of meat in a green sauce. 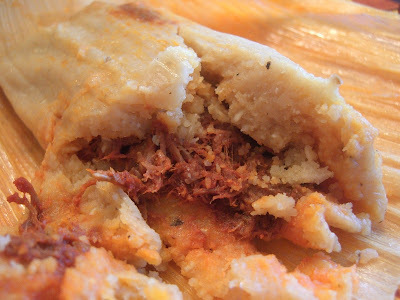 And finally, the beef tamal. Like the chicken, it is in a red sauce. This one has been our favorite of all we've tried so far - earthy, savory and very satisfying. 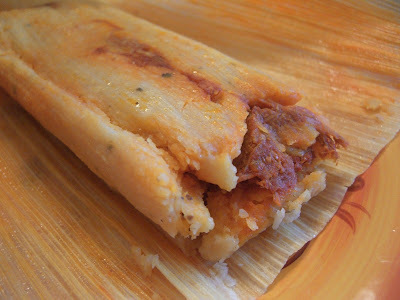 If you are near PB and are craving tamales, definitely check them out. We've been a bit delinquent posting since we got back from our trip to Mexico, but that doesn't mean we haven't been eating well.